A GRITTY second-half rearguard action from WIFC saw them hang onto a hard-earned lead to defeat doughty opposition in MK Dons 4-3 at Woodside – and, in doing so recorded their 9th win of the season. Ross Connor had the hosts ahead inside a minute, stealing in between goalkeeper and centre-back to pinch possession and slot home his 4th goal of the season in efficient manner. And it was 2-0 from the penalty spot some 20 minutes later when Joel Moody converted his first goal since returning from long-term injury, having picked himself up from being upended while trying to waltz past a handful of Dons’ challenges inside the box. Richard Walker replaced the injured Jez Hinds in goal and was soon reaching for the ball from his own net after a breakaway reply from the Milton Keynes visitors halved WIFC’s advantage on the stroke of half-time. 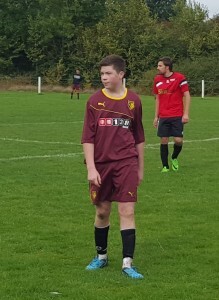 Man-of-the-Match Charlie Wood, who received the stand-in prize of the Ayr United pennant in the absence of its Morecambe counterpart, was everywhere in central midfield for Watford – and it was from his 15-yard shot that Mark O’Connor pounced to stab home his 10th goal of an impressive debut season from the rebound, to make it 3-2 around 15 minutes into the second half. That came after a Dons’ leveller with WIFC caught out by a hopeful free-kick forward. The flight of the ball evaded centre-half Paul Watt and left the visiting striker with a simple tap-in. The Internet ‘Orns restored their two-goal cushion thanks to a fine free-kick delivery from wide which was powered home by the head (or possibly nose) of Dave Soloway for his 4th of the season. But MK Dons weren’t done. And from something like the 20th long throw launched into the Watford box, most of which had been commandingly dealt with by Walker’s come-for-everything policy, the WIFC keeper could only palm out the latest missile to a grateful Dons’ goalscorer. There were one or two further anxious moments for WIFC as late pressure was applied, but the Hornets hung tough for a win by the odd goal in seven. Squad (all played): Hinds, Walker, Watt, Maloney, Stone, De Crescenzo, Clarke, Fellas, Butterick, Wood, Murphy, Moody, Soloway, Connor, O’Connor. Goalscorers: Connor, Moody (pen), O’Connor, Soloway.